Yikes, I have not updated this in a little bit. Bad Don. I'll try to do better. Once I get the tomato seeds planted in my Earthboxes, than I'll make another video. I want to chronicle the growth of these plants from seeds to maturity. One of the things I noticed having the tomato plants inside is that they were growing long stems, but it wasn't strong enough to hold them up. I'm thinking that they weren't really getting enough sunlight and since it was warm enough, I started putting them outside during the day. I would take them in at night because it still gets cool. While that helped them a little, they still weren't standing up straight and it seemed like they had stalled out. 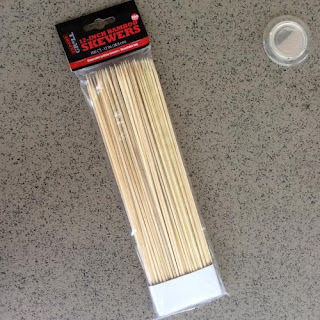 So, I went to Walmart and bought some little wood skewers that you would use on a BBQ grill. 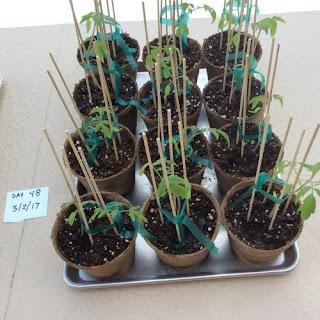 I used them to stake the plants up as you can see in the photograph and tied them with plant tape. The wood skewers were around 88 cents a package of 100, I believe. It drastically helped. Once I staked them up, I think they were able to get better sunlight. Most likely they didn't have to spend their energy trying to hold themselves up. It seemed like overnight, they responded. Now, they have really taken off again and when I plant them in the Earthbox, I'll probably still use the little stakes to stabilize them until they get where they can stand on their own. Fortunately, we've been having nice weather and sunny days so I could just leave the tomatoes outside to soak up the sun. My hope is to transplant them into the Eartboxes in about a week. I'll keep my fingers crossed that we don't hit any cold snaps. Anyway, that's the news on Growing Don's Garden for now.